Scroll to see the latest case studies. Saracen were approached to help Aggreko better understand how their space could be utilised. Following a successful acquisition by the largest privately owned food supplier in the world, OSI, Creative Foods Europe required a new head office to reflect their stature within the market. Saracen Interiors completed a full office fit out for Analysys Mason at its Manchester branch in Exchange Quay Manchester. 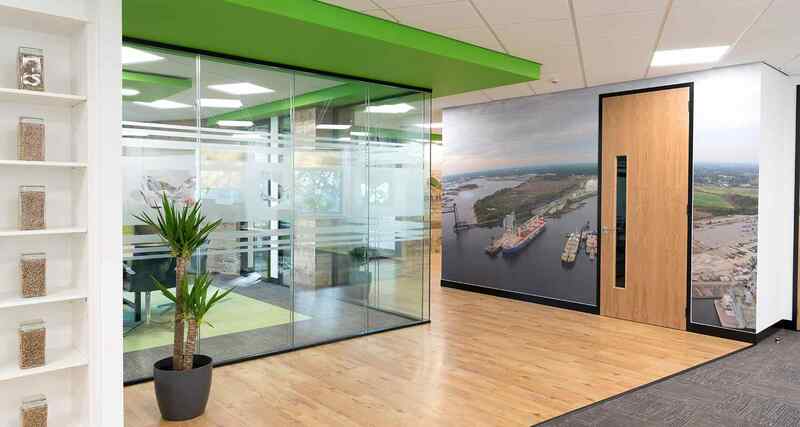 Saracen Interiors transformed the workspace and office environments for Dimension Data, a leading global Systems Integrator and Managed Services provider. The design featured strongly in the early planning stages and Saracen worked closely with the client to ensure the best use of space, while creating an eye-catching, contemporary setting. Saracen Interiors has completed a fast-track, refurbishment project for creative agency, Creature of London. Work was undertaken in the basement library, to make good the damage caused by a leak, with painstaking care and attention taken by the team to ensure that all refurbishments met the high standards.. The workplace consultant, Saracen Interiors completed a fit out project for Sharia Compliant Bank, a Shariah trading investment bank on Old Broad Street.